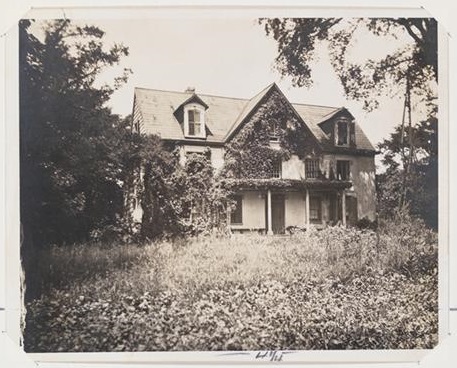 Ferris Grange or Grove Farm, on Ferris Ave. Photo from 1903. 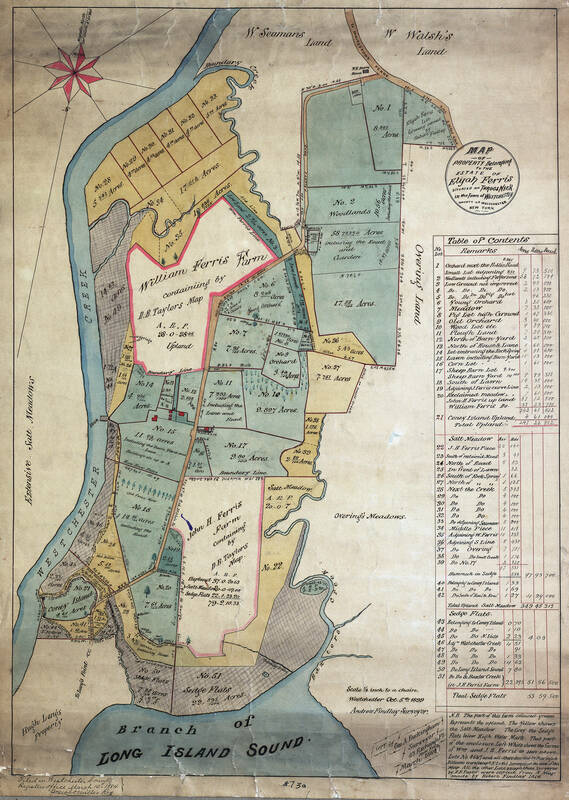 In 1667, Thomas Hunt was given a patent, a land grant, in Westchester County, New York. Some of that land became known as Grove Farm. The area would eventually become part of the Bronx and then part of New York City. It is quite near, but not on, Throgs Neck. It passed through the Hunt family until 1756. At that time, it became the property of Marianne Hunt, who married John Ferris (1733-1814). John Ferris was the great-grandson of Jeffrey Ferris through his son, John. He would be the first, but certainly not the last Ferris to live and prosper at Grove Farm. In some texts, it is known as West Farm. Elijah Ferris (1768-1842), John’s son, would next occupy the family manor. The lands would be divided between his three sons. William Livingston Ferris (1805-1886) and John Haviland Ferris (1799-1862) would receive portions of the extensive holdings. Elijah Ferris property from county map, Oct. 1839. Click for a much larger image. His son, Charlton Ferris (1810-1871) would raise his family here, as well. He would receive the majority of the lands. After Charlton, the trail of Ferris ownership gets a little cold but I will continue to research it. The boys felt sure of their game and the smell of the cakes, and the prospect of cheer beguiled them and good little grandmother knew how to make the best of a bad situation. It was not the first time that these gangs had been about. The cider was hot – set by the fire to heat – good strong cider, with a drop in it. Always there was a plan laid, if an attack threatened. Oh, the grand-mothers of the war time. She joked with the boys saying you’ve caught us this time, you are more lucky than those fellow who came around last, but be easy with us. I’ll treat you well, so don’t destroy what you don’t take, you know the Quakers are peaceable and make friends with everybody, even those who called enemies – but in the providence of things all are one in the sight of the Father. The cider began to work, the hot good cakes did their share and being so softlyen sconced and knowing the man of the house was away, they ate and frank and snoozed a little and the time went on. Finally they went to the barns – to find that all the live stock had been driven to West Chester, and a small army of neighbors had come with guns to help their neighbor – they had been fairly beaten and no blood shed – then our little grandmother laid her hands on her hips and laughed for she was a merry woman, and old Sam, the master par excellence among the servants, said, “We did better then the masta could.” And for his ready wit was filled with cider and dough-nuts. There is a Ferris House on the Campus of Monsignor Scanlan HS…right across Lafayette Ave. from where the Charlton Ferris hOuse…was…I am trying to find out which Ferris lived there?